I tried another origami neko model from Jo Nakashima—the 3D version of yesterday's flat bookmark. 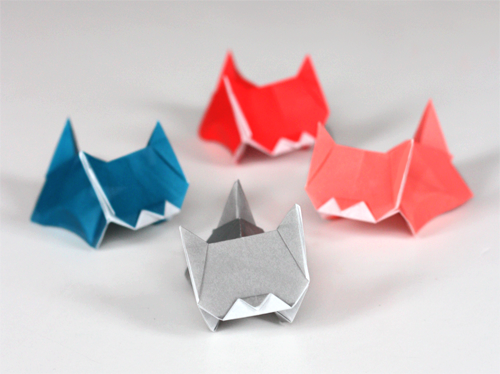 I skipped the step where you shape the cat's back since my crisp paper wanted to crumple. (This is due to my lack of skill, not the fault of the paper, I'm sure.) Follow along with the video tutorial here. Well, there should be no controversy here... these look alive and well! And extremely CUTE!! Extremely cute! I have to try it too! Too cute. Our GS in into Origami so will save the link for him when he visits this Summer. They make my hubby sneeze, too. Otherwise we might have a real one. I love kitties very much. Very cute and I love the bookmarks too! 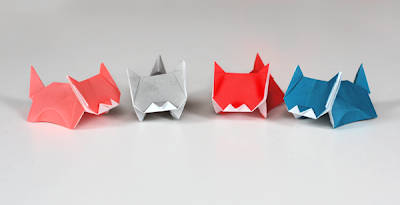 Oh these are adorable and I would love to make them but the video lost me after step #10. So cute.